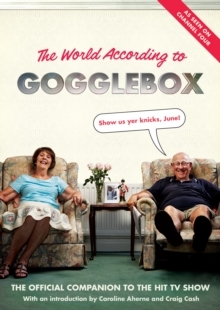 Channel 4's Gogglebox is one of the most loved shows on TV. Every week, more than 7 million of us tune in to watch the nation's favourite telly fanatics as they laugh and cry along with the TV. In doing so, we've fallen in love with being part of the Gogglebox family. Now in this official companion, Gogglebook, for the first time, we sit you on Britain's most famous sofas to find out what it's like to watch TV with all your favourite households. Have a cup of tea with Leon and June, drink from a pot noodle container with Sandra and Sandy, stroke the cats, pat the dogs and laugh along with Steph and Dom, the Moffatts, Jenny and Lee and all the fantastic Gogglebox gang. Remember all the year's big TV moments from all of your favourite shows, and for the first time get the Goggleboxers take on classic TV from the past - ever wanted to hear what Sandra and Sandy think about the moon landings, or Leon and June thought of Princess Diana's wedding dress?It's full of your favourite jokes, fascinating TV trivia and you'll even get the chance to play along at home with Gogglebox TV bingo (#goggleboxbingo) This definitive collection of the wit and wisdom of Gogglebox, covers Alan Carr to Z-Cars and everything in-between. Often funny, sometimes moving, but always surprising, this is the perfect way to enjoy TV the Gogglebox way.